By June of 1999, it had been a full four months since Tinga died. During that time much had happened. 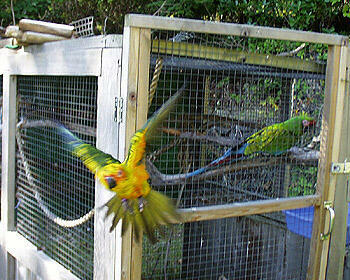 Winston, the feather-plucking Blue-crowned conure had come to live with us. Laika had his toe shredded by Charlie Brown, and had to go in for emergency surgery, and then due to the stress of vets and medication began jumping off my arm when I would get him out of his cage, split his chest open and had to go in to have that stitched up -- twice! And then Inca ran off on his wild flight. The pace of my work was picking up. I had big plans for recording. Too much was going on. I was beginning to wonder if I could handle any more birds. 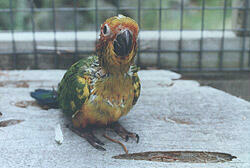 When Jeri Wright called to say that my baby sun conure was ready, I didn't know if I was. Tinga had been the love of my life... but did I really want to start all over with another baby? I thought back on the hand-feeding, the weaning, the first free-flight scares, battling through the bratty years (some would say all of Tinga's years were bratty), and all the other time and energy that went into Tinga's personality development. I knew it wasn't fair to bring a baby bird into my household with expectations of another Tinga. There could never be another Tinga, and what if this bird turned out to be just the opposite of Tinga in every way? Was I setting myself up for major disappointment? So it was on June 24, 1999 with some trepidation that I went to pick up the baby I had already named "Tango". Jeri lives just a few miles away in Gig Harbor. She has a bird-breeding business called "The Wright Roost". I designed her web site several years ago, and have enjoyed visiting her babies ever since. I traded her a year's worth of hosting for this baby. 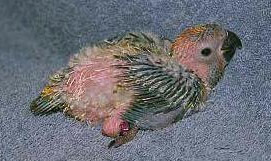 Unfortunately, her sun pairs did not produce any youngsters this year, so she traded a baby Jenday conure, plus some cash, to a breeder in Federal Way, Washington -- Judy Hearron -- for this baby sun. A couple of weeks or so before I picked the baby up, Jeri sent me the photo at right of my kid (approximately five weeks old). It was actually hatched on May 9. Tango was about 6 and a half weeks old when I took possession, and I was very concerned about hand-feeding. I hadn't hand-fed at all since Inca was little... and hadn't fed a little baby since Tinga, five years ago. I asked Jeri to feed it while I was there so I could watch. She feeds dozens of babies almost year round, so she is the expert. One plunge of the syringe and the mush was down Tango's throat. Wait, I didn't see that very well... can you do it again? No, of course not. So home we went, baby Tango in the "basinette", a green plastic tub. I sang the "Ara-tinga" song that Sarah and I had sung to Tinga while we were bringing him home for the first time. At first, I always referred to Tango as a male... taking the opposite approach as with Tinga and Inca. I thought both of them was female before sexing. Maybe by taking a different tact, we would actually end up with a hen. We need some girl power in that bird room! And sure enough, it worked! A DNA blood test revealed that Tango is female. Naturally, Tango was a little standoffish at first. I could tell she was thinking, "Who in the heck is this person here, and why am I getting moved around so much? I want my mamma". Baby Tango at about 7 weeks of age. Slowly but surely we fumbled through the first hand-feedings, and she began to warm up to me. To speed the bonding process, we slept together in my bed, she in her "nursery box". That helped immensely in gaining her trust and favor. Soon enough she was clamboring to get out of her box each morning and anxious to play on top of me. Nothing like waking up to a rambunctious little conure, ready to snuggle with you. At first, all she wanted to do was cuddle and snuggle. Each morning she would get out of her box and lay very quietly under my cupped hand or in the crook of my arm. But as her personality and confidence began to develop she began exploring around the bed, going under the covers and popping back out. I was sad to see the snuggle phase pass away, but excited to see her playful personality emerging. Way too soon she grew up. When I got her, her head and back were still full of pinfeathers. But they came rushing in and flushed out in the blink of an eye. Seems like she was only a baby for a week or so. Then one morning, she came out of her nursery box and flew! Just a foot or so straight up off the bed, and then gently down again. That day and for another day or two I practiced with her, lofting her up and letting her land on the bed. In the morning, laying on the bed, I would toss her gently into the air and she would fly around a bit and come right back to me. Very quickly she gained her flying confidence... and hasn't stopped since. In August a very strange thing happened. I came home from work one day to find Tango tangled in the drawstrings of the roll-up bamboo shutters in the bird room. For four years we had lived with those shutters and none of my birds ever found a way to get tangled up in the drawstrings. But Tango did. Apparently she had been tangled for awhile, and every time she tried to fly off the shutter, she tightened the string around her leg. I quickly cut the string and extricated her from the tangle, but was fearful that there had been no blood flow to the foot. I massaged her foot for ten minutes or so and she seemed noticeably better, but still wouldn't put any weight on it. I tried soaking the foot in warm water, which she didn't like, of course. Afterward, she still kept the foot pulled up in her chest feathers, standing on the other foot. I decided that only a little time would be required for everything to return to normal. But the next day I noticed that Tango was gnawing on one of the toenails on that same foot. Indeed, she had basically gnawed her toenail off! So off we went to the vet. Dr. Scott Ford checked the foot thorougly and thought that there was no permanent tissue damage from the string incident, and placed a bandage around the bloody toe. His prognosis for the toenail ever growing back was not good. The next day I came home from work to find that Tango had gnawed the toenails off two other toes of that foot! Back we went again to the vet, with two more bloody toes. This time, she got a bandage that covered the entire foot, so that at the least the remaining toenail couldn't be destroyed. I suppose that the uncomfortable, tingling sensation of not having much, if any, feeling in the toes prompted her to gnaw at the toenails... probably feeling no pain whatsoever as she destroyed the nails. She quickly recovered, however. The bandage came off. The toes healed. One toenail remained. The others have never grown back. And Tango has never again resumed gnawing on toenails. Through that first summer and into fall, Tango's personality and indoor flying skills continued to develop. As she grew and became more confident, I knew it was time for her to begin free-flying. Yet, I was hesitant. I couldn't stand the thought of losing her. And any time you let your bird outside, there is the chance of losing them forever. But one day I reread my piece on Tinga's death, and was reminded of my own words: "hopefully another little punkin� will come along to free-fly to the treetops and willingly return to me. Only then might this wound to my heart be healed, if it ever is." I knew I had to free-fly Tango. In October, she began her outdoor training. I held her tightly as I walked around the property, allowing her to begin to get a feel for the acreage she would be flying over. Then I had her practice flying to me from either side of the deck. From there she graduated to flying to me from the "Big House" aviary in the back yard. And from there to flying back to the deck from various trees around the yard. She did superbly. Finally, all was right with the world again. I had a free-flying sun conure once more!